For those coming across Payoneer for the first time and tends to know what it is all about. 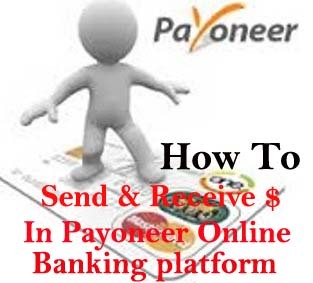 Payoneer is actually an online payment company that provides a free online banking platform for its registered account holders, for receiving or sending money in currencies like Dollar or Pounds via online. How can I convert the money I received from payoneer transaction to my country local currency cash? Is it possible to send money from one payoneer account to another account without MasterCard been issued? Is it possible to transfer/send money to payoneer without account? How do I register payoneer account for free and get the mastercard shipped to my country within few days of application? >> You May Like To Read How I Received My Own Online Payoneer Bank MasterCard For Free Of Charge. Read on to get the answers of the frequent asked questions below. But before then, it is good to notify you about some of the measures you can take in order to earn money from online platforms like through Google Adsense, Ad.fly, Revenue hits, infolinks, Exoclick, Propeller Ads etc and get those earned money in dollars transferred to your payoneer account. Although, these sources of earnings I mentioned can be used on blogs or websites. But there are other ways to get your payoneer acct fund with dollars, and one of them is through Payoneer referral that pays you $25 instantly. As an e-currency company payoneer is, they are with likes of webmoney, PayPal, payza, etc. Before now, they used to support money transfer to PayPal accounts and to their likes too, but currently, they don’t support that any longer. And we the users are still looking forward to know the reason why the both company (paypal and payoneer with other likes,) decided to take such action, well that’s by the way. Although before now, when paypal and payoneer are still in partnership with each other, one can easily get a verified PayPal account using his or her working Payoneer account. Now getting a Paypal account from some countries is not as easy as it was since payoneer stopped the service they were rendering to users through paypal. Most people were so interested in transferring money from payoneer to paypal due to good dollar exchange rate they were getting from third parties. But since the service was blocked, I have been making a good exchange rate from third party through payoneer to payoneer transfer service that is available to almost all the active payoneer account holders. Below is How To Transfer Funds From One Payoneer Account To Another Right from Your Acct Dashboard. >> Before talking of accessing the feature or function of money transfer on payoneer, you have to register and have account with them first. The registration is free, so to register click here. (And remember, this answers the number 3, 4 frequent question listed above). >> After registration, you can then proceed to earn $25 from each referral. Click here to see how to go about that. >> Next, login to your payoneer account and click on "Pay" button at the top left corner of your screen. Once you click on that, the tab will display a drop down menu then, Click on "Make a Payment." >> Now on the space option for "To," in order to transfer money to another acct, just type in the person’s email address which is linked to his/her payoneer account. Also enter the amount of money you wish to send with reason for the payment (you can leave the option for reason of payment blank if you want. As inputting that may result to delay in transfer.) Now click on "Continue" to proceed. >> Final step, in order to Confirm your payment, just click on where you see "Approve Payment" button and you are good to go. Now 2 mails will be sent to your mailbox. Where the first is talking about notification informing you that they have gotten your order to make a transfer to the acct you provided. While the other, is a confirmation message saying the money has been transferred /sent to the recipient. >> Like I said earlier, you need to open a Payoneer online banking account. Also stand a chance to earn a free $25. >> After the registration, ensure to have your MasterCard attached to your account active and functioning well, as expired cards won’t be able to send or receive payments. >> Since you are the one receiving the fund this time around, send your email linked to your payoneer account to the person sending the money to you, and asked them to follow the guides on this blog in order to carry out the sending successfully. >> After the person must have sent the money, you being the receiver will get notification on that and your account will be updated with the exact figure or amount sent by the sender. Note: The payment by transfer shouldn’t take longer time to show on your own account or to the receiver’s acct depending on who is sending or receiving. However, you may have to wait for like 1 to 2 hours or even more in some cases, but be rest assured that your money will surely get to your account without issues. 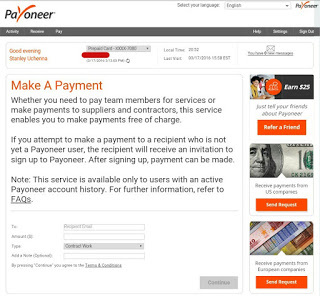 In case you don’t want to use the provided method above in receiving your payment, you can still make use of the other feature also provided by payoneer to customers, it is called "request a payment" and can be located at the top left corner of your device screen under "Receive" tab, when you login to your dashboard. Here are what you need to know about the service. >> The service is free, there are no charges attached to it. >> As shown from the provided image above, the minimum amount one can actually transfer is $50. So in other words, you can’t transfer below that amount. >> The maximum amount of money you can actually send out to another account per day is $2,000. >> The maximum amount an account holder can receive on payoneer for a period of 30days is $15,000. >> And the max. amount one can actually send out within 30days is $10,000. For now, this is all we can inform you on how to receive/send money from one payoneer acct. to another payoneer account. Feel free to make your contribution using the below comment box. And in case you have any question, we would love to attend to your question and give you possible lasting solution as we can. Don’t forget to share. Thank you.